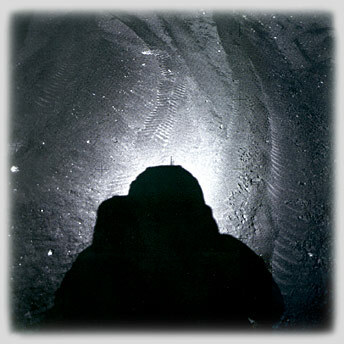 Opposition Effect - Shadow hiding and more..
Apollo 17 astronaut Eugene Cernan's photograph of his own shadow cast on the coal black lunar surface December 1972. His shadow, or more accurately his camera's, appears to be surrounded by a bright glow. Photo from the book Full Moon by Michael Light. ©Michael Light, used with permission. Cernan's shadow, like many imaged on the Moon's surface, is surrounded by a bright aureole. It is an example of the "Opposition Effect". Lunar soil has an open structure with many areas of deep shadow. But, when looking in a direction directly away from the sun, shadows are hidden by the object casting them. The antisolar point and the adjacent areas therefore appear brighter than elsewhere because they have more sunlit surfaces and less shadow. There are other factors that contribute to the glow, retroreflection by crystalline minerals and a phenomenon called coherent backscattering. The heiligenschein, also at the antisolar point, is a separate effect. The opposition effect was so named because it is substantially responsible for the brightness of the Moon and Mars at opposition, i.e. when they are near the antisolar point in our sky. The Moon's brightness at full is greater than can be accounted for by the increase in its illuminated area compared with its partial phases.